The market for USB Type-C headphones and dongles is growing as more and more smartphone manufacturers abandon the tried and tested 3.5mm connector for this newer standard. The move to digital headphones remains controversial, but the costs and ecosystem compatibility problems have so far proven more than a little problematic. If you’ve been wondering just what the differences between USB Type-C and traditional headphones are, then look no further. We’re going to dive into how this technology works: its pros, cons, and pretty much everything else you’ll ever want to know. The whole purpose of moving over to USB audio is to go digital. That is, to stay in the digital domain for longer before converting to analog, preserving signal quality for as long as possible. Smartphones, for example, are hotbeds of high-frequency clock signals and power lines. Not the type of circuitry that you want to run your high-quality analog audio signals near. Give this link a read if you need a primer on digital vs analog signals. Switching to USB audio simply moves the DAC and amp components from inside the smartphone to the inside the headphones or dongle cable. As every pair of headphones now has to ship with its own DAC circuitry, this is more expensive in the long term. But now that headphone companies are in charge of these circuits, customers will experience high-quality audio just by purchasing good headphones—in theory. Music remains in digital form across the cable with USB Type-C headphones. But this requires more components than a 3.5mm cable. The move also introduces additional complexity when it comes to sending the audio signal. USB audio data transmits information as packets rather than a continuous stream of PCM audio and also requires a clock signal to keep everything in time when the data reaches the DAC. After USB transfer, data packets are decoded into a single audio data stream format that a DAC understands, such as I2S. The choice of clock system is actually very important for USB audio. There are many ways to send data over USB: bulk, interrupt, control transfers, and isochronous data. Isochronous is best for media data, and comes in three further transfer methods – synchronous, asynchronous, and adaptive. Synchronous is no good for audio as the audio clock rate caps to the USB speed, which doesn’t divide correctly by typical audio sample rates and therefore suffers from jitter—something that hasn’t been an audible problem for a long time. Adaptive transfer is better, as it offers a variable packet byte size and the clock rate and audio data stream sample rate is configurable by the host. However, this means it can experience some problems with jitter if the host and receiver lose synchronization. Asynchronous transfer is where the audio device’s oscillator determines the synchronizing USB clock and also links this to the speed of the DAC, therefore minimizing the risk of jitter. Jitter, by the way, occurs when a clock goes out of sync, causing data to be misread or miswritten. Unstable clocks jitter, which results in data read and write errors, and DAC timing distortion. USB audio isn't just about data transfer, it also includes digital communication for on-device features. Isochronous is popular because higher speed data transfer allows for data to be re-sent in time if an error is detected. The latest USB 3.1 specification includes a more robust synchronization scheme for these transfers, and is an optional feature for the latest USB Audio Class 3.0 specification for audio products. USB audio isn’t just about data transfer, it also includes digital communications for on-device feature controls that you don’t get with analog audio. For that, we need to know a little more about USB Audio Classes. The USB Audio Class specification allows a USB device to identify itself as an audio peripheral to announce compatibility with a range of specific USB functions and communication types suitable for audio. USB Audio Classes existed before USB Type-C and work with both the new and legacy connectors. Digital data for both audio and function controls are transmitted over the D+ and D- USB pins, although there are a few different specifications that define exactly what information to transmit over the USB pins. Using a USB OTG cable to turn external audiophile DACs into host devices has been a bit of a workaround for a while. However, this only transfers audio data. The best way to use the full set of available audio features over a USB port is to build devices, like headphones, that work with the USB Audio Device Class (ADC) specifications. Version 1.0 dates back to 1998 and still works well, but the latest 3.0 revision is far more interesting and important for modern headphones. All of the audio class specifications break down into three parts – AudioControl for inner function controls like volume or EQ, MIDIStreaming for sending MIDI data, and AudioStreaming for the PCM audio data both to and from the headphones. Android smartphones running 5.0 Lollipop or newer all support a subset of version 1.0 as a minimum, and many newer devices support class 2.0 and even 3.0 too. One big difference between Audio Class 1.0 and 2.0 is speed. Version 1.0 existed before High-Speed USB 2.0. Data speeds cap at 12Mbps with USB 1.0, and ADC 1.0 maxes out at 8.2Mbps. Audio Device Class 2.0 works with speeds up to 480Mbps and uses up to 196.6 Mbps for audio. Both are more than fast enough for high-quality stereo music streams and the biggest difference is in the number of channels each can support. USB Audio Class 1.0 supports up to 32-bit/96kHz or 16-bit/192kHz stereo audio. However, Android’s default implementation caps this to 24-bit/48kHz. Version 2.0 boosts this to 32-bit/384kHz, although this faster speed comes at the cost of higher power consumption making it less ideal for portable devices like smartphones. USB IF USB Audio Class transfers more than just audio data. The AudioControl interface grants control over headset features like microphone volume, channel mixing, and even on-device EQ. This depends on what the headset supports, but provides a universal interface for features. USB Audio Class 3.0 isn’t any faster for stereo audio, but it does offer some important new features for modern headphones. The standard reduces power consumption with support for power idling in between isochronous data transfers, bringing power consumption back in competition with the traditional 3.5mm jack. It also offers a more robust packet error protection scheme, making it less susceptible to jitter and data loss. Audio Class 3.0's main benefits are better power efficiency and support for advanced processing features. 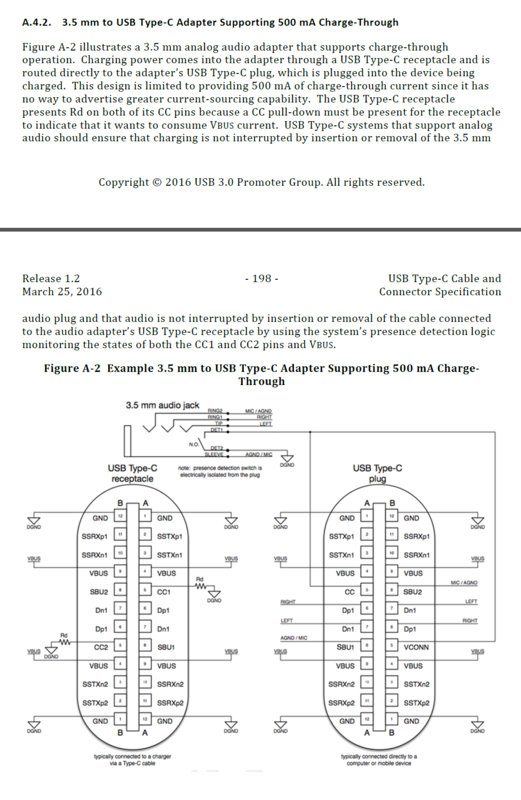 The standard mandates USB Basic Audio Device Definition (BADD) declaration for hardware, which defines common features sets like microphone controls. The standard also introduces more AudioControl functions for advanced features like noise and echo cancellation. This is important to correctly expose these features to software over USB controls so that music player apps can take control of these functions without the need for proprietary software or USB communication methods. Digital audio isn’t the only way to listen to music with USB Type-C headphones. The standard also supports “Audio Accessory Mode”, whereby the D+/D- pins switch roles to support analog audio signals. Again this isn’t a new technology to USB Type-C. Phones with and without the new connector are specially designed to handle the negative voltage swing of the analog audio signal. 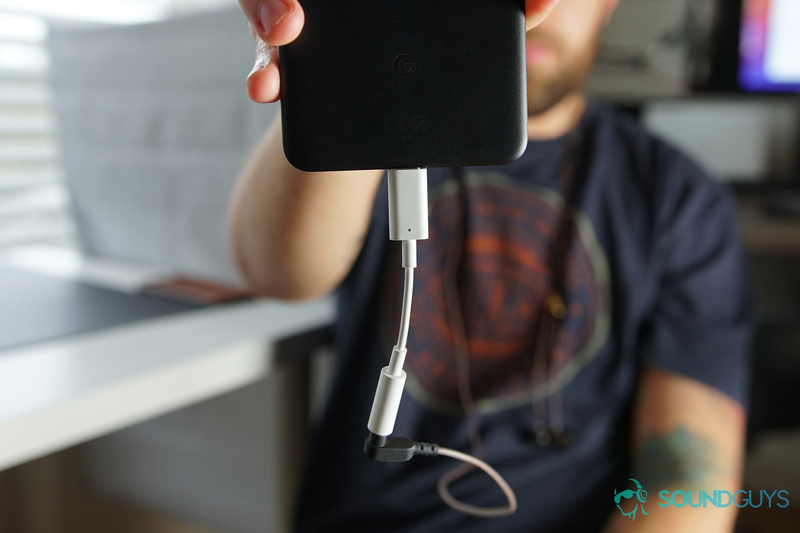 Accessory Mode is popular with older USB audio dock devices and the Android Open Accessory Protocol 2.0 with audio support has been around since Android 4.1. Texas Instruments An example of how audio accessory mode is supported over USB Type-C.
With a USB Type-C connector, two 1k ohm pull-down resistors connect to the CC pins to signify an audio accessory. This lack of a digital handshake simplifies development, making these devices passive and low power. The SBU sideband pins allow for a microphone signal to pass back to the host smartphone too. Type-C devices can still charge using a passive splitter, but fast charging using Power Delivery requires a much more complicated and expensive active circuit. This approach is bad design, and only suitable for backward compatibility. Routing audio this way is no better than using the 3.5mm audio jack (digital signals aren’t used) and is often worse: the audio signal is placed next to noisy power and high-speed data lines, potentially reducing performance. Unfortunately, many new USB Type-C dongles and headphones make use of this mode, and support isn’t universal in the smartphone space either. This leads to many compatibility problems that consumers experience today. All of the above applies to the new market for USB Type-C headphones and is equally applicable to USB Type-C to 3.5mm cables and dongles. These also come in active and passive varieties. Audio Accessory Mode is not universally supported by smartphones, causing headphones and dongle compatibility issues. The former benefits from digital audio and an integrated DAC, just like digital USB headphones. These can support USB Audio Class specifications too, although most of them will just implement a DAC and amplifier rather than any post-processing components. Passive dongles simply work by exploiting USB Audio Accessory Mode to obtain an analog signal from your smartphone, and as such are usually the cheaper option. As you can see, there are a lot of options in the USB audio space which can and has led to confusion. Unfortunately, there often isn’t an easy way to tell how nicely two devices will play with each other, or which features are supported. For now, the best bet is to dive into product spec sheets and try to find out which version of USB Audio Class it supports. Either that or just stick to Bluetooth headsets.